Whether you're navigating across the Pacific, visualizing planetary orbits from your backyard, or looking for a handy reference guide to the heavens, Pocket Stars offers flexible and fast visualization of the solar system and beyond. Based on data from the Jet Propulsion Laboratory and the US Naval Observatory, Pocket Stars offers extremely accurate positional information for solar system bodies, stars, and Messier and Caldwell objects. Targeting astronomers, celestial navigators, and the casual observer, Pocket Stars offers numerous tools for visualization, identification, animation, and computation of position based on celestial observations using a sextant. Reduction from sextant altitude to observed altitude for any of the 9110 stars, nine planets, and sun and moon is quick and easy. Pocket Stars lets you visualize the heavens from two different vantages. First is a traditional starchart view drawn from an observer's location anywhere on the surface of the earth. This vantage is called "2D Star Chart". The other vantage lets you zoom through the solar system, approaching the sun from any angle. This vantage is called "3D Orrery". 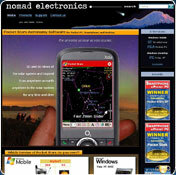 · User interface optimized for simple and fast star and planet identification. Single click on any body to get the name, designation, calculated altitude, azimuth, and magnitude. Drag the cursor to move through the sky. Display of constellations and body names are controlled by a single click. You cannot download any crack or serial number for Pocket Stars PC on this page. Every software that you are able to download on our site is legal. There is no crack, serial number, hack or activation key for Pocket Stars PC present here. Our collection also doesn't contain any keygens, because keygen programs are being used in illegal ways which we do not support. All software that you can find here is freely downloadable and legal. Pocket Stars PC installation package is prepared to be downloaded from our fast download servers. It is checked for possible viruses and is proven to be 100% clean and safe. Various leading antiviruses have been used to test Pocket Stars PC, if it contains any viruses. No infections have been found and downloading Pocket Stars PC is completelly problem free because of that reason. Our experts on malware detection tested Pocket Stars PC with various spyware and malware detection programs, including fyxm.net custom malware and spyware detection, and absolutelly no malware or spyware was found in Pocket Stars PC. All software that you can find on our servers, including Pocket Stars PC, is either freeware, shareware or open-source, some of the software packages are demo, trial or patch versions and if possible (public domain licence), we also host official full versions of software. Because we want to be one of the fastest download sites on the web, we host all the software including Pocket Stars PC on our servers. You cannot find here any torrents or download links that would lead you to dangerous sites. Rate Pocket Stars PC 5.5.0.0!